The GranCabrio is one of the latest models of Maseratis’, it was presented on display at the Frankfurt Motorshow 2009, and is priced at £95630! The GranCabrio is the first car in Maserati’s history to be a four-seater convertible; it has two doors and has a top speed of 175mph! The car does 0-62mph in 5.4 seconds and is a rear-wheel drive with 440bhp. The GranCabrio would be suited to both male and female drivers. It is upmarket, executive, and luxurious, whilst being sporty! The GranCabrio was designed in Italy and will be built at the Maserati factory (Viale Ciro Menotti) in Modena, Italy, where Maserati have been based since 1940’s. There are many features and qualities to the GranCabrio; The Maserati trident sign is on the wheels as well as the front grill which is an inward curving scoop. On either side of the grill are circular Xenon lights and beneath these suave lights are air intakes; the main feature of the front of the car remains the grill with vertical lines which are well spaced and the Maserati trident sign is poised centrally on the grill and beneath the Maserati emblem giving the car a sophisticated look. The GranCabrio has a horsepower of 405hp. The interior is luxurious and comfortable, with plenty of personalisations available for the seats, dashboard, and even the floors and steering wheel. There are 14 colours available in leather and there are options in wood too, with the option of a BOSE` system. The soft-top canvas roof has three layers and folds up and down; the roof is capable of folding down in 28seconds, with the car travelling up to 30km/h. 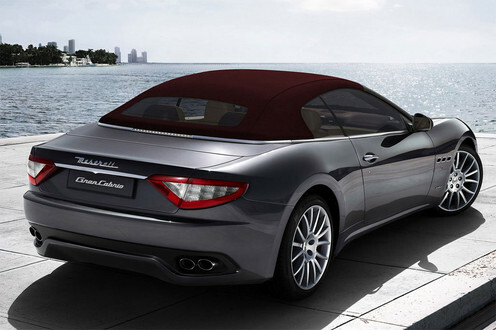 The fold down roof makes this Maserati exclusive and this GranCabrio is to go on sale next spring! The interior is handcrafted and is spacious with a sleek look to it, in between the passenger seats and conjoining to the dashboard is a centre piece with features such as air-vents, a clock, and an onboard computer display where you can also put a CD on, beneath the computer are buttons and a display for the music. The gear-stick is below and there is a place to put your drinks for both the passenger and the driver. There are chrome rings for the dashboard switches and steering wheel with an Alcantra finish on the back of the steering wheel paddles. The display information behind the steering wheel incorporates the use of stylish analogue dial displays for the speed and revs, there is also a computer display in the centre which shows what gear the car is in. There is no handbrake and instead there is an automatic electronic brake which activates when the car engine is switched off. The exterior of the car is well-built with many attractive features, the bonnet has a V shape to it which makes the car look stylish in design, and there are dual exhausts on either side of the car. The lights at the front of the car are elongated and endearing they are wide yet subtle and smart. The lights at the back of the car are trendy and triangular in shape with a red triangle around a white triangle – these red and white lights incorporate the use of 96 LED’s and add to the appeal of the car. There is also the implementation of a rear diffuser which works in helping with the GranCabrio’s road handling. The car is designed to be aerodynamic and this helps with the car’s agility, there are tiny gills on either side of the car. The body shape is curved at the front and sculptured smoothly from front to rear with a horizontal incline toward the rear and the wheel archs are elegant as are the design lines of the doors, the bumper is curved and extends further from the rear body to give the car extra finesse. This Maserati has a six speed ZF automatic transmission and there is a gear stick as well as paddles on either side of the steering wheel both of which can be used in Manual mode. The engine is a 4.7 litre V8 and the alloy wheels are sized at 20” as standard. The GranCabrio sounds sporty and is well-tuned for performance. Auto Normal mode shifts gears automatically at low rpm to achieve the most comfortable ride and at higher rpm when driving style becomes more sporty. Auto Sport Mode changes gears 40% faster than in Normal Mode, downshifts when lifting off as a corner approaches; then it activates the stability control, stiffening Skyhook suspension, and opening exhaust valves when engine is over 3000 rpm (in GranTurismo S Automatic). Auto ICE mode reduces maximum torque at the wheel, prevents 1st gear starts, and only allows gear changes below 3000 rpm. The Maserati has intelligent technology and the GranCabrio ensures stability through electronic monitoring and optimising and the electronic system corrects skid and wheel spin by reducing torque and distributing the braking between the front and rear axles. The CEO of Maserati, Mr Harald J. Wester, in his speech at the Frankfurt Motorshow said of the Maserati GranCabrio that it presents an enhanced sensation of driving combined with two signature traits of Maserati, craftsmanship and technology. The GranCabrio is described as a car for true connoisseurs and is refined in every aspect, its interior, performance, technology and exterior. 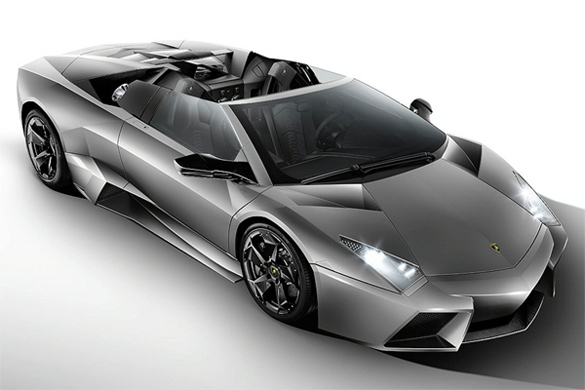 Lamborghini has produced a brilliant Roadster as a predecessor to the Reventon Coupe`! This roadster sports car is a model that is beautifully stylish and is expected to provide an exhilarating drive! The car is Italian in engineering and has German designers; it has a concept car design that will immediately attract attention wherever you are. The Lamborghini Reventon Roadster was launched at the Frankfurt Motor Show on 16th September 2009 with a price tag of 1.1 million euros. There have been 15 of these cars built and they are considered limited editions, as a result this limited series will be a car for collectors! The open top two seater is available in two colours a Matt Black and a Metallic Grey! The Roadster is reported as having outstanding handling and the interior has different materials such as aluminium, alacantra, and leather, there is also use of stitching on the central panels and the seat cushions for an executive and luxurious feel! The craftsmanship involves the use of many techniques, such as the implementation of fine curvatures on the body of this magnificent Roadster, this allows the car to be as aerodynamic as possible and this reduces the weight of the car whilst driving at top-speeds. There are also well shaped air intakes inspired from stealth jet fighters which are prevalent on the sides the rear and the front. The front of the car is jagged, yet the design is so exquisite that the jagged bonnet blends attractively with the air intakes beneath the beautiful Xenon headlights which are built neatly within the body of the car. The car is made from high strength steel along with carbon fibre elements. The Reventon Roadsters predecessor is said to be inspired by the design of F22 delta raptor stealth fighter jet and also the Lamborghini Murcielago. The Reventon Roadster is a further enhancement of its predecessors and on display in its design is the use of angles which can be found on all different parts of its sculptured body which is made from carbon fibre. The doors in traditional Lamborghini style open spectacularly upwards and the lights at the back of the car are within a shape that gives the appearance of turbo boosters! The large central exhaust adds to this effect! The Roadster also has the word Lamborghini on the back of the car between the brake lights in italic adding to the elegance of the Roadster. The Reventon has many features inside; there are the futuristic and modern LCD computer displays which relay information about the car such as speed and gear and other information such as the condition of the car and there is also a G – force meter reader which tells the driver the G-force felt by the car when cornering, braking and accelerating! There is also an option to have the computer display traditional analogue dials. There are safety roll bars that extract from behind the driver and passenger seats if the car is about to roll over. The car’s curves and fine lines in design should make performing manoeuvres whilst at high speeds seemingly effortless. Being a Lamborghini the Roadster will be good at handling corners and amazing in a straight line, as it is a top of the range sports car. The designers have incorporated sports gear paddles on either side of the steering wheel for the fastest and smoothest of gear shifts, which will enable the driver to experience a pleasant and thrilling drive, depending on the speed they are at! The Front apron has the Lamborghini badge, and there are tiny angled indicators on the side of the front wings, there is a single large windscreen wiper, and there are side mirrors stylishly shaped and that match the colour of the alloy wheels. The edges of the windscreen also match the colour of the alloys and there is an engine which is encased towards the rear of the car, reminiscent of a gilled stingray. The rear wings, which are raised angles made with fine lines, join neatly together to provide a wheel arch, these wings then slope upwards, whereas the front wings slope downwards giving the car height at the back. The acceleration on this car is 0.62mph in 3.4sec! The Manual E-gear consists of 6 gears. The Alloy wheels are as standard and have a “Y” shape to them. For every wheel there is a double wishbone suspension. There are three modes the car can drive in – Normal, Corsa, and Low-Adherence. The Reventon has an impressive top speed of 205mph producing a healthy noise you would associate with a sports car of this calibre. The car is elegantly crafted for the smoothest of drives and the power in the engine which is a 6.5v12 provides 670hp ensuring that this is a Lamborghini sports car is in the realm of Super-sports cars and will provide the smoothest and quickest of drives! The engine has 12 cylinders at 60˚ there are also 48 valves. The Maximum torque is 6000 revs p/m and has a Maximum power of 8000 rpm! The front of the car can be raised by 40mm (1.6in) the Alloy wheels at the front are 18” in size and the rear alloys are 19” in size. The air intakes also known as air channels in the shell of the body function to cool the four wheel brakes, which have carbon fibre ceramic discs alongside six piston callipers. There is a spoiler which helps with the down-force of the car aiding in maximum grip for the car, the spoiler emerges when the roadster is at 80mph and shifts to a further vertical angle when at 136mph to provide the car with further down force and grip to the road. The Reventon’s main competition at the Frankfurt Motor-show were the Mercedes SLS and a brand new Ferrari and also a recently announced McLaren. The Roadster’s have already been sold and Lamborghini has further enhanced their sport’s car range with a designer piece! The CEO of Lamborghini Stephen Winkelmann told everyone at the Frankfurt Motor-show whilst presenting the Reventon Roadster that this Lamborghini has a permanent 4 wheel drive which provides the car with excellent grip, there is also a traction control system! The CEO ended his presentation by saying that Lamborghini build cars that aim to fascinate!